Last night the little red-haired girl and I attended a showing of the 8th series premiere of Doctor Who, featuring the true debut of Peter Capaldi as the 12th incarnation of the Doctor. Though I’m the long time sci-fi nerd of the family, my wife actually loves Doctor Who more than I do, and we’d spent the summer trying to get our Who fix by re-watching Matt Smith episodes, and watching Torchwood for the first time (which really is good, the Angel to Doctor Who’s Buffy). I came into this premiere with as little information as possible (basically just the series 8 trailer) and tried to set my expectations low. Doctor Who transitions can be a bit tricky. When David Tennant left if seemed like no one could replace him. And then Matt Smith and particularly Karen Gillan did more to inject fun and a sense of adventure into the series than anyone before. We caught this series mostly on Netflix and Hulu and it took us more than a year to watch the first four series. We gobbled up all of Matt Smith in maybe a month. Here’s the bit where I warn you I’m going to get all spoiler-y. Not too much probably, but for the fussier among you, maybe wait to read this until you’ve had a chance to watch the new special. But if you’re really a Who fan, what are you waiting for? Overall, I liked the 12th Doctor okay, but I found myself in much the same place as Clara Oswald in not really knowing if this was “my” Doctor. (As a side-note, while from a narrative perspective I understand why Clara would be shocked at the transition, in her case she knows more about the Doctor’s incarnations than anyone as the “impossible girl” who has been present at all points in his time-line). I like that Capaldi’s playing the Doctor Scottish, and I don’t mind the older Doctor in principle (though I’m not one of the purists who thinks this is necessarily how the Doctor should be, he’s been doing fine in the care of younger men). The main problem was the writing, as evidenced by my title line for this post. Fan-favorite characters of Strax, Madame Vastra and her wife make another appearance, and the story is told in their 19th century London. I like these characters, particularly Strax, but they don’t seem to fit the tone they’re trying to create with this Doctor. I know that plenty of characters have had crossover between Doctors, but these three in particular just seemed to fit most with Matt Smith. Most Doctors have a pretty clean break with the previous personality, even if they sometimes retain companions, but a lot of this special still seemed to be pandering to the Matt Smith fans among us (including a cameo appearance, and Capaldi’s use of the line “Geronimo”). There were several other “fan-service” lines throughout which I’ll leave you to discover. This episode, featuring a callback to a series 2 episode, might have made for a better mid-season entry. It doesn’t do enough to establish the series’ new direction. We get hints at the differences in the Doctor’s personality, including some frankly distasteful traits where he steals a tramp’s coat (or at least threatens to and apparently gives away his watch instead, which isn’t that his Time Lord soul containing watch?). We watch him shove dead man’s skin onto Clara’s face. We’re left to wonder whether he killed the main antagonist (which is a fairly un-Doctor thing to do), and we watch as he leaves Clara to her fate amongst a bunch of cyborgs, even being snarky about keeping the sonic which could have helped her (“I might need it”). Yes, he does save her in the end, but I don’t get the impression it’s because he had faith that she could take care of herself. But actually, that’s okay. Establishing a different direction for the Doctor is fine. It’s when it feels like a mish-mash or a half-step that this episode doesn’t quite work. And if this is the avenging Doctor, the one who will go “into darkness” to right some of his wrongs, wouldn’t he be a bit of a better person while trying to do that? I did like the bits about the meaning of his face, the dinosaur (which while gratuitous was funny, including spitting up the Tardis). And we do get a teaser at the end that there will be a season long or possibly even character long arc, which worked to great affect with Smith’s run. The new opening theme was terrible. I know it’s more in keeping with the theramin opening of the very first episodes, but frankly I think the opening’s been going downhill since the beginning of the modern series. Series 1-3 (best), Series 5-6 (good), Series 4 (okay), Series 7 (okay), Series 8 (terrible). So I’ll need more to decide if I like this 12th Doctor. And I have a feeling we’ll be buying the episodes on Amazon shortly (especially since I saw Daleks in the preview). 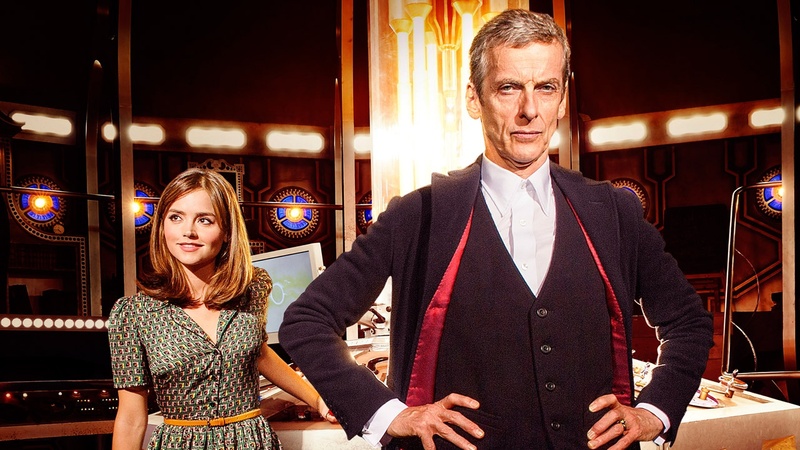 What did you think of the new Doctor?